Thanks to all who came to the class this Saturday. We had over 50 people there again! Wow! You all really amaze me! I am so grateful that so many people want to come to my classes. You’re amazing! Unfortunately I printed out handouts for everyone but left them in the car! So, here’s the link to a pdf of the handout. I’m so sorry I forgot to give them to you! Many people have asked if the information is in one of the cookbooks. 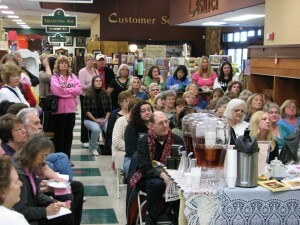 The sandwich information is in the Master Tea Room Recipes cookbook. This book was originally intended for other tea rooms, caterers and people doing large parties but I’m finding that a lot of my customers are interested in this book as well. I’m sorry I didn’t have more copies at my booth. The cookbook is on special for $49.95 from now until April 30th. 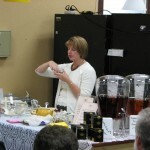 The next class will be May 1st at 11:00 AM and will focus on Large Tea Parties, Brunches and Tea Buffets. Just in time for Mother’s Day! Have a wonderful week! For all of you loyal on-liners, I have a few specials coming up for you. I didn’t want you to feel cheated because you couldn’t come to my classes. Look for them in April! « Sandwich Class This Saturday!